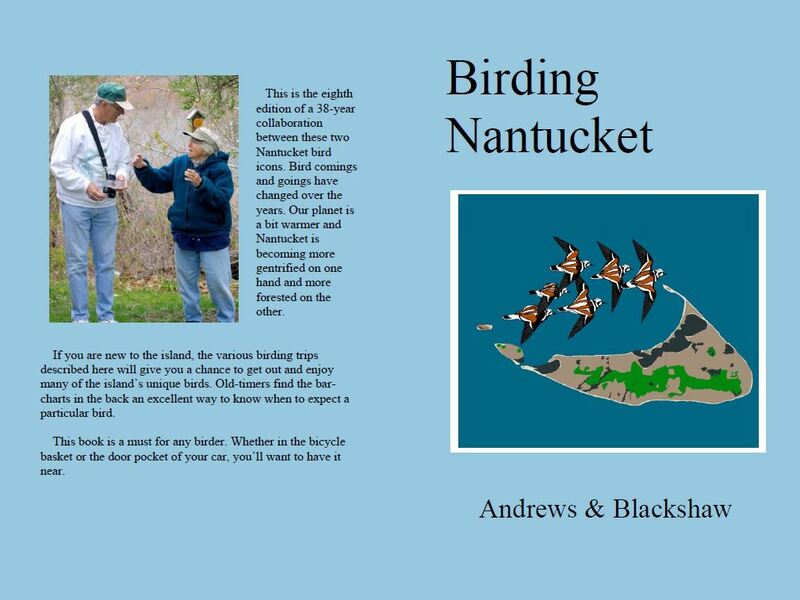 Revised in 2014, this is the eighth edition of an almost 40-year collaboration between these two Nantucket bird icons. Bird comings and goings have changed over the years. Our planet is a bit warmer and Nantucket is becoming more gentrified on one hand and more forested on the other. If you are new to the island, the various birding trips described here will give you a chance to get out and enjoy many of the island’s unique birds. Old-timers find the bar-charts in the back an excellent way to know when to expect a particular bird. This book is a must for any birder. Whether in the bicycle basket or the door pocket of your car, you’ll want to have it near. Mitchell's Book Corner, Nantucket Bookworks, Geronimo's, or from the bookstore in the sky Amazon.com. You may also phone in orders at 1-866-308-6235 ext. 5120. Send Ken a Note! Send Edith a Note!